When outdoor advertising is presented as the solution to our growing city budget failures in light of our ailing economy, we must remember that the proposed benefits are often not worth the loss of public space. Take for example the approximate 8,000 phone kiosks in New York that hold advertising content. That number is based on talking to the four companies, Van Wagner, Vector Media, Prime Point Media, and Titan media which operate phone kiosks in the city. Van Wagner has 3,000, Titan 1,000, Prime Point 800, and Vector who would not tell me anything, approximately 3,000 based on their presence in Manhattan which is similar to Van Wagners. Each phone kiosk has three ads attached to it, making there about 15,000 ads per month strewn across our streets and neighborhoods. For this the city collects about $13,000,000.00 dollars a year. that ends up being .00026 of New York's operating budget or 1/40th of one percent. When we are justifying the destruction of our public environment for incredibly small amounts of money we are hiding the commercialization of our public lives. This is not a budget problem issue so much as it is a result of the trend to finance our cities budgets through private as opposed to public agencies which often results in the lack of public control and accountability to how are cities are run and for whom they operate. The budget crunch may be giving some New Yorkers "ad nausea," now that the city is thinking about selling ads on its buildings and vehicles. City Council Speaker Christine Quinn floated the idea of selling advertising space on city-owned buildings and vehicles. The idea is seen by some as a creative way to help fill huge city deficits, but some wonder how much more New Yorkers can take with ads hanging from buildings, encasing entire trains and soon to reach even the subway tunnels. "It seems to make sense that there would be a saturation point," said Vanessa Gruen, director of special projects at the Municipal Art Society. "Once it spills out to residential areas … people object to having it in the neighborhood." She added "I can't see Chanel or Gucci putting an ad up on a garbage truck." James Cox, 39, of Bay Ridge, a train conductor, is philosophical about even more ads all around him. "I think it's a good idea to make money, but it's just more visual pollution. It's inevitable though. They're just going to make the city a big advertisement." The proposal comes as the council considers the governor's study of leasing the state lottery, highways and bridges to generate revenue. Quinn said her staff has been discussing similar ideas but that she had not considered any specific properties, according to the Associated Press. "It's an exercise we should conduct to see what possibilities are there," she said Wednesday at a Citizens Budget Commission breakfast, where she discussed the global financial crisis. "There might not be any, but there might and it's certainly worth going and seeing if anything can be found." The city could generate up to $10 million to put toward billions in deficits by selling ads on garbage trucks and city vehicles, according to one estimate. The city is facing a $2.3 billion deficit in the coming fiscal year and $5 billion in future gaps, which will widen with the current problems on Wall Street. Ads on trains and buses are a normal part of New York's landscape, but garbage trucks are a new frontier, possibly a profitable one despite a faltering economy, experts said. Revenues from these kinds of ads have continued to grow nationwide since 2001, according to the Outdoor Advertising Association of America. "Outdoor advertising is still growing despite the softening of the economy," said Jeff Golimowski, spokesman for Outdoor Association of America "It's very cost effective for the advertising. It reaches a very diverse population in a targeted way. "Other cities have considered or implemented garbage truck ads, naming rights of stadiums and even ads on school buses, experts said. While some companies would jump at the idea to advertise on a garbage truck--there are already ads on public garbage cans--the concept may be a tough sell for others. "Certain advertisers would consider the medium inappropriate for their message," said Jodi Senese, executive vice president of marketing for CBS Outdoor. "There are some advertisers who would not be concerned with the association with garbage --think about if you're a disinfecting household product." 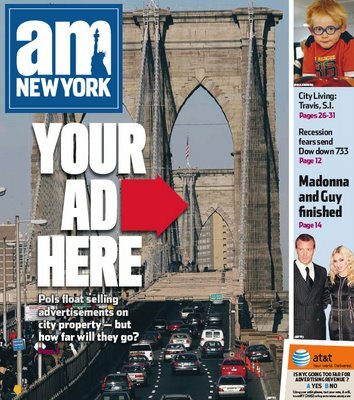 If the governor's study eventually pushes naming rights on state bridges or the city considers expanding their advertising-revenue ambitions, they might have a fight on their hands. Last year, public criticism scrapped a Port Authority idea to allow Geico ads at the George Washington Bridge. Taking advertising further to city buildings could prove difficult as the city has sold off many properties in the past and strict advertising regulations reign in a lot of possibilities. Landmarked properties pose another hurdle. "That would take so much away form the beauty of New York," Gruen said. "That's what people come to New York to see and you don't want it covered up with advertising." Tim Voltz, an IT consultant from Gramercy, seconds that. "If it's just putting up more billboards on the side of buildings, that's okay. But if it's putting a big sign on the top of the Chrysler Building, that's not okay."